Venezuelan migrants arrive at the "Divina Providencia" migrant shelter to receive a free lunch in La Parada, near Cucuta, on the border with Venezuela, Colombia, Monday, Feb. 11, 2019. Such an operation could provoke a dangerous confrontation at the border - or fizzle out and leave Maduro even stronger. 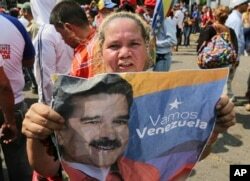 A supporter of Venezuela's President Nicolas Maduro holds a poster of him during a rally in Urena, Venezuela, Monday, Feb. 11, 2019. ​Maduro has made a show of overseeing military operations played on state TV almost daily. He's jogged with troops in formation, mounted an amphibious tank and railed against what he says is an impending U.S. invasion that he has likened to a Latin American Vietnam. "It's not help and it's not humanitarian,'' he said to cheers from roughly 1,000 Maduro supporters, including civilians and soldiers. 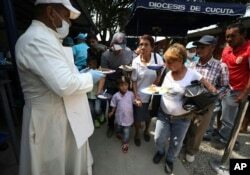 Priest Richard Garcia hands out free lunches to Venezuelan migrants at the "Divina Providencia" migrant shelter in La Parada, near Cucuta, on the border with Venezuela, Colombia, Monday, Feb. 11, 2019. "We're working hard,'' he said in one call. "Not only to bring in the aid, but also to end the tyranny'' of Maduro. Gaby Arellano, an opposition leader who is among those leading the aid mission, said the strategy was to conduct "defiance'' politics, which she said consists of setting an agenda that forces Maduro's hand, though she provided no details.